Halley's Comet passed perihelion in its fourth known passage, as determined from records by Chinese astronomers. J. Palisa discovered asteroid #204 Kallisto. C. H. F. Peters discovered asteroid #270 Anahita. A. Charlois discovered asteroid #319 Leona. G. Witt discovered asteroid #422 Berolina. A. Kopff discovered asteroid #612 Veronika. P. Shajn discovered asteroid #1654 Bojeva. S. Arend discovered asteroid #2666 Gramme. Goethe Link Observatory discovered asteroids #1762 Russell, #2496 Fernandus and #2528 Mohler. Purple Mountain Observatory discovered asteroids #2045 Peking, #2514 Taiyuan, #2539 Ningxia, #2899, #3048 and #3746. 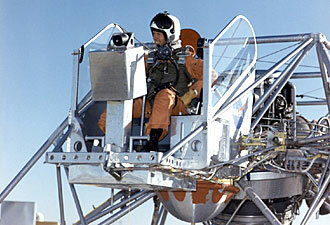 NASA test pilot Joseph Walker flew an Apollo Lunar Landing Research Vehicle to an altitude of 300 feet. A test model of the Lunar Landing Research Vehicle, designed to simulate Lunar landings, was flown by former NASA X-15 pilot Joseph Walker to an altitude of 91 meters (300 ft). Built by Bell Aerosystems Company under contract to NASA, the research craft had a jet engine that supported five-sixths of its weight. The pilot manipulated solid-fuel lift rockets that supported the remaining one-sixth, the amount of weight it would have on the Moon, and the craft's attitude was controlled with jets of hydrogen peroxide. L. Chernykh discovered asteroids #1855 Korolev, #1856 Ruzena, #1956 Artek, #2030 Belyaev, #2031 BAM, #2468, #2561 Margolin, #2877 Likhachev, #2948 Amosov, #3126 Davydov, #3441 and #3659. USSR launched Cosmos 368 from Baikonur, a Bion precursor mission which conducted biological investigations and studies of the physical characteristics of outer space. L. Zhuravleva discovered asteroids #1910 Mikhailov and #2475 Semenov. S. J. Bus and J. Huchra discovered asteroid #2174 Asmodeus. E. F. Helin discovered asteroid #2860 Pasacentennium. L. Zhuravleva discovered asteroid #2760 Kacha. L. Chernykh discovered asteroid #3588. Communication with the NASA Pioneer Venus Orbiter ended after its propellant ran out and it dipped into the atmosphere. Russia launched Foton 8 from Plesetsk on a Soyuz booster for a space materials microgravity research mission conducted jointly with Germany that lasted 250 orbits, with the capsule returning to Earth on 24 October 1992. China launched Jianbing 93 (FSW-1 No. 5?) from Jiuquan on a Chang Zheng 2C (Long March) booster, whose capsule was not returned in a timely manner because of orientation errors during the re-entry burn. China launched Jianbing 93 (FSW-1 No. 5?) on 8 October 1993 into a 209 x 300 km orbit at 57.0 degrees inclination. In addition to an Earth observation payload, FSW-1 5 carried microgravity research equipment and a diamond-studded medallion commemorating the 100th anniversary of Chairman Mao Tse-Tung's birth. The spacecraft operated normally until 16 October when an attempt to recover the satellite failed: An attitude control system failure aligned the spacecraft 90 degrees from its desired position, causing the re-entry capsule to be pushed into a higher elliptical orbit (179 km by 3031 km) instead of returning to Earth. Natural decay did not bring the capsule back until 12 March 1996. An Ariane 44L launched from Kourou carried Mexico's Solidaridad 2 and Thailand's Thaicom 2 communications satellites into space, which were positioned in geosynchronous orbit at 113 deg W and 78 deg E, respectively. Russia launched the Progress M-29 unmanned resupply vessel from Baikonur to Mir. Russia launched the Progress M-29 unmanned resupply vessel to Mir on 8 October 1995, initially into a 194 x 242 km x 51.7 deg orbit. It docked with the rear port of Mir's Kvant module on 10 Oct 1995 20:32:40 GMT, because Soyuz TM-22 was docked to the front port. Progress M-29 undocked from Mir on 19 Dec 1995 09:15:05 GMT,and was destroyed in reentry on 19 Dec 1995 16:15:00 GMT. Total free-flight time 2.36 days. Total docked time 69.53 days. During the 4h 58m ISS EO-3-1 EVA, ISS cosmonauts Dezhurov and Tyurin made a spacewalk from the Pirs module to install the Strela crane on the outside of Pirs, and jettison some thermal covers. There was some difficulty closing the Pirs hatch.